Since I was in a fall mood with the card below, I decided to watercolor this beautiful pumpkin by Paper Inspirations. Pumpkins are one of my favorite fall images and I adore watercoloring . . . it's very peaceful & calming for me. I used this sketch by CPS. The pumpkin was stamped in Timber Brown StazOn on watercolor paper and colored with Stampin' Up's Aqua Painter and dye reinkers. The edges of this piece were rounded and sponged with cocoa ink and matted with burgundy cardstock. The autumn printed paper was matted with Marvy's Mega Scalloped Square punches of burgundy cardstock, trimmed to fit the 3/4" strip of patterned paper. It is raised on dimensionals and copper hardware trims it, along with a piece of orangey-copper edged brown organdy May Arts ribbon. The background paper is DaisyD's Morroccan Floral and the corners were rounded. It's all layered onto a pumpkin 5.5" x 4.25" card base and the edges sponged with cocoa ink. 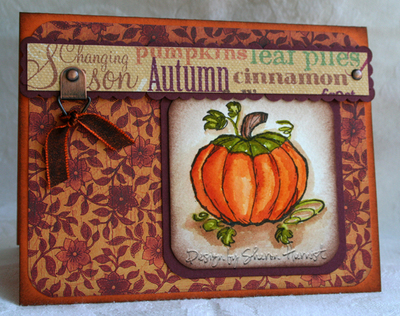 Paper: SU Pumpkin & Burgundy Cardstock, DaisyD’s Morroccan Floral, Flair Designs Autumn Words. Ink: StazOn Timber Brown, SU Reinkers: Pumpkin, Rust, Olive, Caramel, Cocoa. Accessories: SU Aqua Painter, Copper Hodgepodge Hardware, Sm Corner Rounder Punch, Dimensionals. Marvy Mega Scalloped Square Punch, May Arts Brown/Copper edged Ribbon. I know it's a little early (or late!) 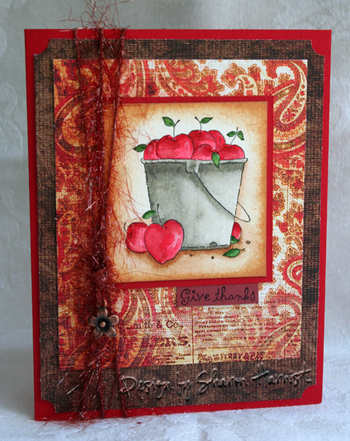 to be thinking of fall but I had this watercolored apple bucket sitting on my desk for a few months that I never got around to putting on a card. So I decided to finally do something with it, using Card Positioning System's (CPS) sketch challenge to make a fall-themed card. After watercoloring the image on watercolor paper with Stampin' Up! dye reinkers and an Aqua Painter, I sponged the edges with tea dye Distress Ink. 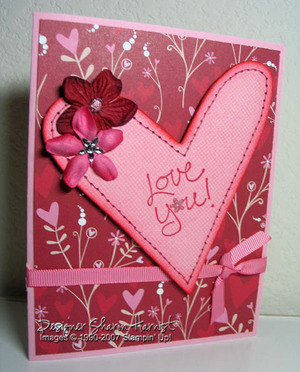 It is matted with real red cardstock and the sentiment stamped on burgundy cardstock. 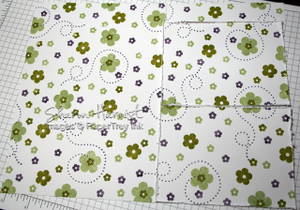 The paisley layer was a tag from DaisyD's Gypsy Paisley collection (yum-O!) that I trimmed the top tag part off and the chocolate tapestry pattern is Hazelnut from the same collection. This layer's corners were clipped with SU's ticket corner punch. Burgundy-red fibers were tied around the card and a copper flower charm hung from them. The card base is real red and measures 4.25" x 5.5". Stamps: Stampin’ Up! Give Thanks apple bucket. Paper: SU Real Red & Burgundy Cardstock, Watercolor. DaisyD’s Gypsy Paisley-Hazelnut & Heirloom Tags. Ink: StazOn Black, Ranger Tea Dye Distress Ink. SU Reinkers: Red, Garden Green, Burgundy, Gray, Caramel. Accessories: SU Aqua Painter & Ticket Corner Punch, EK Success Adornments fibers-Halloween, Oriental Trading Company aged copper flower charm. Lori also sent this cute paper by DCWV that has glittery accents all over it! I loved the lavender colors in it (accented with orange shades), so I chose SU's lavender lace as a card base. I chose two of the three patterned papers she sent and cut them into 2" wide strips and used this week's SplitcoastStampers sketch challenge for my layout. It was a familiar layout to me because Roxie (the challenge host) chose a previous card I made as the template! Lori had stamped these birds onto shimmer white cardstock -- one of my favorites to work with when watercoloring (I wish the shimmer showed up in the photo). I used an Aqua Painter to watercolor the bird and her flower with SU's dye reinkers: amethyst, lavender, celery, orange & bordering blue. Then I lightly gave the background a sunny wash of banana reinker (it's really not that blotchy or dark in person, I guess that's the effect on the camera with the shimmer of the cardstock). I clipped the corners of the focal image with SU's Ticket Corner Punch and matted it with lavender lace cardstock. It is mounted with dimensionals to the orange mat. The little row of orange flowers are Doodlebug's Paper Frills in tangerine and I filled the flower centers with glitter. 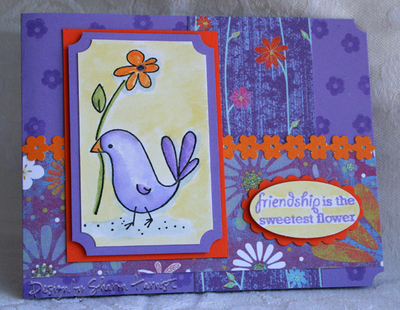 I accented those little flowers with the smallest flower from PAPERTREYink's Little Lady set, Versamarked on the lavender card base. The sentiment is from PAPERTREYink's Green Thumb set, stamped in lavender classic ink on shimmer white cardstock and punched with SU's large oval punch; it also got a wash of banana color. The orange mat was hand cut with Fiskar's scalloped scissors (I can't wait for PAPERTREYink's June 1 preorder date for all of Marvy's scalloped punches, so I don't have to do this anymore!). To finish off the card, I punched the right side's card base corners with the Ticket Corner punch. Check out the other girls' cards by clicking on their names/links above. Lots of fun, Lori -- thanks for the challenge! I can't wait to see what they all came up with . . . it's fun to see how differently we all think & design with the same supplies! This card was for my niece's birthday this weekend -- I like how it turned out for a teenager whose favorite color is pink! The card base is 5.5" square and is from a dry embossed set of box cards by DCWV (found at Michael's), with 10 different patterns in it -- these are the Dots. I stamped the tiny flower from PAPERTREYink's Little Lady set all over the background in pearlescent coral and graphite black Brilliance inks by Tsukineko. The focal PAPERTREYink ladybug is also stamped in these colors (on PAPERTREYink's white cardstock) and the coral is so pretty and shimmery! 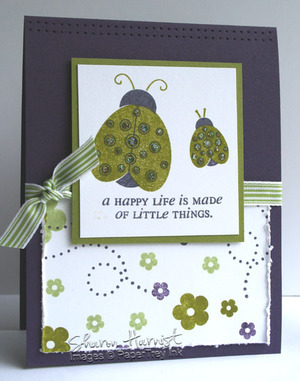 The sentiment is from A Muse -- I thought it went perfectly with these cute ladybugs! The sentiment is naturally curved up like that and the "lady" part is at the end, after "little". 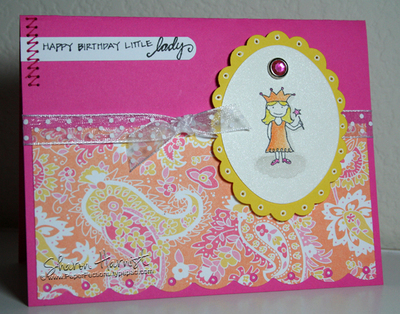 I just stamped the "lady" separately and put it on a little tag that is popped up and accented with a pink brad (SU). The focal image is matted with two Marvy Giga Scalloped Square punches of black cardstock layered together to make a rectangle. It is popped up on dimensionals. Pink striped May Arts ribbon (from StarLitStudio) finishes off the card. Printed papers are from Stampin' Up's Enchante collection and they were layered onto a pale plum card base. A double row of faux stitching "holds" the papers together on the left side, and the right corners were also stitched. Pewter brads anchor the lower left corner. The focal image (SU's Happy Harmony) was stamped by inking the rubber directly with Stampin' Write Markers: perfect & pale plum and sage, then stamping onto vanilla cardstock. The flower centers were highlighted with 2-Way Glue pen and Dazzling Diamonds glitter. The sentiment was stamped in perfect plum. It is matted with sage cardstock and accented with a Pewter Hodgepodge Hardware swirl clip and eggplant grosgrain ribbon that really does match better in person! The image is then mounted with dimensionals to the card. I hope these cards & article inspire you to try faux stitching on your cards! Our other ritual is sleeping late . . . ahhhhh! Do you have any rituals to start off the summer? Share them below in the comments! Dawn wrote to me and asked if I would show a visual on how to extend the length of the Word Window punched piece I used in this card below. So here you, go, Dawn . . . as I said below, you just need to precut your sentiment strip in the height of the Word Window's punch (3/8"). Turn your punch over to the bottom so you can see the shape it punches. Place your sentiment strip into the punch from the top and just clip that right edge. This works well with a number of other punches, too, so try your hand at a lot of different extended shapes! Speaking of punches . . . head on over to Nichole Heady's blog to see the cute things she's creating over the next few days with the Marvy scalloped punches you can start preordering from PAPERTREYink on June 1. I'm sure she'll change your mind on the ones you might *need* just like she did mine! Happy Memorial Day to all my fellow Americans. When I heard about the AMuseAPalooza contest this week to use punches, I started searching for my stash of A Muse stamps . . . I hadn't seen them since moving back in September! When I found this adorable little princess, I decided to make my youngest daughter's 5th birthday card and be ahead of the game for July. I stamped her in black StazOn on SU's shimmer white cardstock and watercolored her with Stampin' Up's Aqua Painter and dye reinkers: orange, yoyo yellow, pink passion & gray. I punched her out with the Marvy Mega Oval and then matted her with a yoyo yellow Giga Scalloped oval punch. Then I punched holes in the scallops with a paper piercing tool and outlined the holes with Signo White Gel pen. A pink MM crystal brad was added to the top of the oval for some bling (you girls love their bling at ANY age!). She is mounted with dimensionals to the pink passion card base. Patterned paper is Making Memories Maddi Paisley (from Eclectic Paperie) and has all my daughter's favorite colors: yellow, orange & pink! I scalloped the bottom edge of the paper using a small corner rounder punch (SU) with the corner guard taken off and then punched holes in each of the scallops with the Crop-A-Dile's 1/8" circle punch. The centers of those holes were highlighted with a white gel pen dot. TIP: When making scallops, start in the center of your length of paper and work to one end. Come back and punch from the center to the other end -- that way, your last scallops end up the same size & shape. The A Muse sentiment was also stamped in black StazOn and cut to 3/8". Then I put just one end thru Stampin' Up's Word Window punch and rounded the right side. The left side is faux zig-zag stitched using SU's paper piercing template, pad & tool and pink passion Stampin' Write Marker. A bit of white May Arts dotted organdy ribbon finishes off the card. As promised a couple of posts below HERE, I made some more cards with that OSW (one sheet wonder) I stamped using SCS's color challenge this week of olive, celery & eggplant or violet and PAPERTREYink's new Little Lady stamp set. I got four more cards out of it and still have a few strips left over! 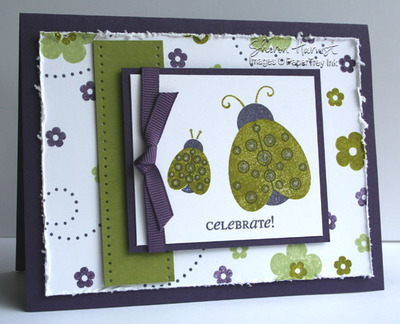 Almost that same layout as the first card in the post below -- horizontal orientation and a large panel (5" x 3.75") of the OSW -- the main image is just a little larger and also stamped with the larger momma ladybug, in olive & eggplant. I used the clear Stardust Gelly Roll pen to give their spots a little sparkle! Eggplant grosgrain (SU) is tied around this panel that's matted with eggplant cardstock and mounted on dimensionals. There's a strip of olive cardstock that I pierced, behind the main image. Card base is eggplant. This is also an eggplant card base, turned vertical. I divided the same size OSW panel I used above in half to get two more cards out of it! This is a typical Valerie layout which I use again and again (thanks, Val)! The focal image is those same ladybugs as above and I used the clear Gelly Roll Glaze pen on their dots. Then I decided they should also be sparkly, so I sprinkled Dazzling Diamonds glitter over it -- now their dots are raised AND sparkly! The sentiment is originally one long line but I inked just the first half of it with Stampin' Up's eggplant Stampin' Write Marker and stamped it, cleaned the stamp, then inked the last part of the sentiment and stamped it just under the first line. This was all done without the use of the good ol' Stamp-A-Ma-Jig because these stamps are made of acrylic, so you can see right through them to line them up perfectly! The main image is mounted on dimensionals (seriously, what would I do without those things -- love them!) and celery striped May Arts ribbon is tied around the card. To finish it off, I added a double row of piercing at the top of the card base. Here's the other half of that smaller OSW panel (3.75" x 2.5") from above, used as a focal point and its edges distressed. There happened to be enough space in the middle of it to stamp the smaller ladybug crawling through the flowers and of course (you guessed it) -- glitter on her dots (this time using Zig's 2-Way Glue pen)! Can you tell I like glittery stuff just a little bit? ;) This panel is matted with olive cardstock, tied with May Arts dotted white organdy ribbon, and mounted with dimensionals to the white card base. That same long sentiment line as above -- this time I shaped it in a wavy pattern on my acrylic block and stamped it to look like a little ladybug trail. It's stamped in classic olive ink (SU). Those teeny-tiny ladies are from the "handmade by" stamp that comes in this set! That's another great thing about PAPERTREYink's stamps -- Nichole has designed a unique "handmade by . . ." stamp for each set to date that coordinates beautifully with it! That girl knows how to help us make professional-looking cards, right down to the backs of them . . . thanks, Nicole! When I first saw this set online when it could be ordered May 15th, I immediately saw an "S" shape in that ladybug trail. So here it is . . . your own personal note from "S"haron! It is stamped in olive ink and the two little flowers stamped in eggplant. The other words are Karen Foster's Snap Stamps, stamped in eggplant. See this post HERE for some information about the KF stamps. This panel is matted with eggplant and tied with May Arts white organdy dotted ribbon. It's all mounted with dimensionals to the olive card base that has a 5.25" x 2" strip of the OSW attached to it. The left edge of the OSW is distressed with Heidi Swapp's distressing tool. So there you have it . . . 5 cards from one sheet of custom-stamped cardstock and I still have makings to get 1 or 2 more cards out of it! I hope you all have a wonderful holiday weekend and stay safe. I still have a few more of the faux stitching cards to post, so watch for those. Time to change up that straight faux stitching with a little zig-zag! Sorry the colors are looking a little off in this photo -- this card is a perfect plum base and has the swirl from Carte Postale stamped down the left side in perfect plum classic ink. For the quilted piece, I cut squares of four different patterns of designer paper from the Enchante collection and adhered them to a strip of pale plum cardstock. Then I faux zig-zag stitched the strips together by piercing every other hole in the Stampin’ Up paper piercing template and then connecting the holes with perfect plum Stampin’ Write Marker. This strip was adhered about ¾” from the left side of the card. 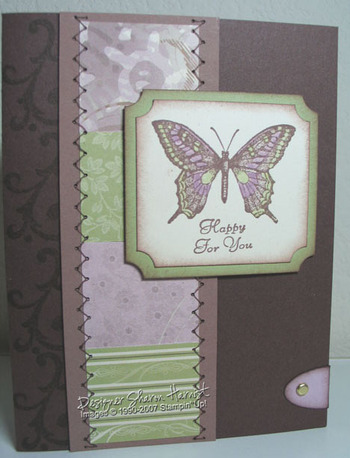 The focal image is the butterfly from A Touch of Nature stamped in Timber Brown StazOn on vanilla cardstock. I wanted a softer look, so I used a blender pen with classic ink pads to color the butterfly with plum & celery. The Fancy Flexible Phrases sentiment was also stamped in Timber Brown StazOn. The corners of this piece were clipped with the Ticket Corner Punch and matted with celery cardstock. The edges of both pieces were sponged with cocoa ink. The piece was mounted with dimensionals to the card. A tab was created with the small oval punch (other half is wrapped around to the inside of the card), the edges sponged and adhered to the lower right side with a gold brad. One of my favorite things to do is combine some challenges from Splitcoaststampers. These are this week's color and sketch challenges . . . all I had to do was pick a stamp set and get stamping! Since I had just received my new PAPERTREYink Little Lady set, I picked that up and went to town. 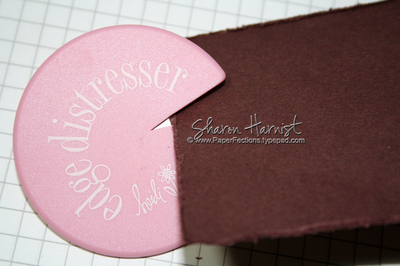 I stamped a whole sheet of white paper -- PAPERTREYink's new 110# weight paper. OMGoodness, this stuff rocks -- it's SOO much heavier & thicker than Stampin' Up's! After the first time I tried making a whole card out of SU's white cardstock, I vowed I would never do it again -- way too flimsy in my opinion. But I can assure you, you'll be seeing a lot more white card bases from me in the future! For the card above, I used a piece of my stamped background, measuring 5.25" x 4" and adhered it to my old olive card base (5.5" x 4.25"). The sketch called for a 1.25" x 2" strip in the center, so I cut and stamped that. The sentiment "with thanks" is meant to be straight but since it's made of flexible acrylic, you can bend it into any shape you want! And since Nichole Heady is a stamping genius, she designed her stamps in different parts, so I could easily stamp the ladybug bodies in celery, their dots in eggplant and their antennae in olive! I matted the ladybug piece with eggplant cardstock and pierced the edges with SU's paper piercing template, pad & tool. It is mounted with dimensionals and eggplant grosgrain ribbon tied around the card. I'll try to get a few more cards made with my OSW (one sheet wonder) and post those by tomorrow. Sorry I'm just getting around to posting the next group of faux stitched cards that appear in the June/July summer issue of Stamper's Sampler Take Ten magazine article on faux stitching (available June 1). If you've missed them to date, they start out HERE in this post. I was flat on my back in bed all day yesterday but feeling more like myself today, thank goodness! 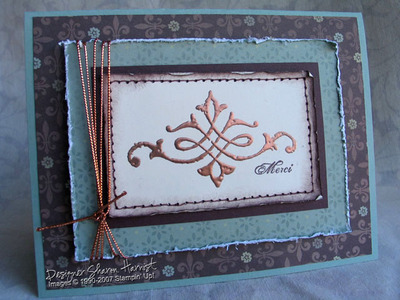 This card started with a 5.5" x 4.25" base of sage shadow cardstock, layered with the Fleur-de-lis patterned paper from Stampin' Up's Enchante designer paper. These papers were my favorite to date, I think, with the chocolate and sage muted patterns -- I really hope they appear again the new catalog release in July. Next, I distressed the sage layer around the edges with SU's edge distressing tool (made by Tonic) and tied copper metallic cording around the piece before adhering it with dimensionals to the card base. The focal image is from Carte Postale and I heat embossed it with Classy Copper EP on very vanilla cardstock. Merci is stamped in chocolate chip, then the whole piece was pierced using the Crafter's Tool Kit paper piercing template, pad & tool and then faux stitched with chocolate chip marker. Chocolate chip ink was sponged around the edges, which I distressed slightly with my fingernail. It is matted with chocolate chip cardstock. The focal image was mounted to the sage layer. This card was my favorite in the more subtle grouping. It is 5.25" square and started with a card base of chocolate chip. Since this 50's stampin' girl (prim & proper in her white gloves!) reminded me somehow of sewing, my mind immediately jumped to BasicGrey's Stella Ruby papers. If you haven't seen them, some of the papers have sewing pattern markings on them (that's one running across the bottom left corner of the coral paper) and the prints themselves remind me of all those pretty floral dresses reminiscent of that era. These images Jami provided came on whisper white paper and separately. After determining my layout, I knew I wanted the sentiment to be with the main image, so I mounted them together onto chocolate chip cardstock, and placed the chocolate chip grosgrain over the seam. I watercolored her with an AquaPainter and dye reinkers: cameo coral, creamy caramel, barely banana, bashful blue. She is shadowed with a very light gray marker I got from Anna. The edges were sponged with cocoa ink. Lisa, here's your Pac-man photo! All you have to do is place your cardstock on that razor blade inside the Pac-man's mouth and pull the distresser down the edge of the cardstock. It will rough up the edges and then you can further distress them a bit with your fingernail. That's it! So, back to the card . . . after layering my papers onto the card base, I faux zig-zag stitched the top blue-green piece and bottom of the striped piece, to help tie in with my sewing theme. Next, I layered chocolate and coral Prima flowers, placed brads in the centers, and adhered them with glue dots to the blue-green strip. I mounted the focal image with dimensionals and finished with a copper Hodgepodge oval clip tied with chocolate ribbon. Thanks so much for the challenge, Jami -- it was great fun! Another part of her challenge was to "pay it forward" and challenge a few other stampers, if we choose. So watch your mailboxes, some of you will be getting some surprises soon! 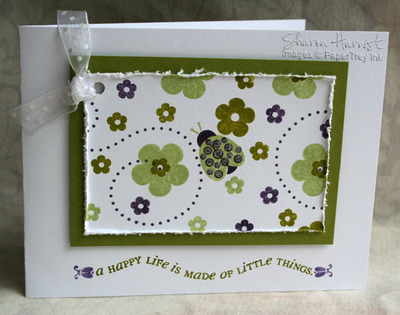 All supplies except patterned paper, Prima flowers & edge distresser are from Stampin' Up! 1. Technorati -- If you use this for your blog feeds, you can now easily add me to that list. Look for the "Add this blog to my Technorati Favorites" button over on the top left sidebar right under the "Visit My" links. 2. Technorati blog search -- It seems my other search function didn't actually search just my blog but this new search DOES. It's located right across from the link above, on the right sidebar "Search My Blog". 3. Frappr Map -- Located at the very bottom of the right sidebar. Check out where my visitors come from and add yourself. 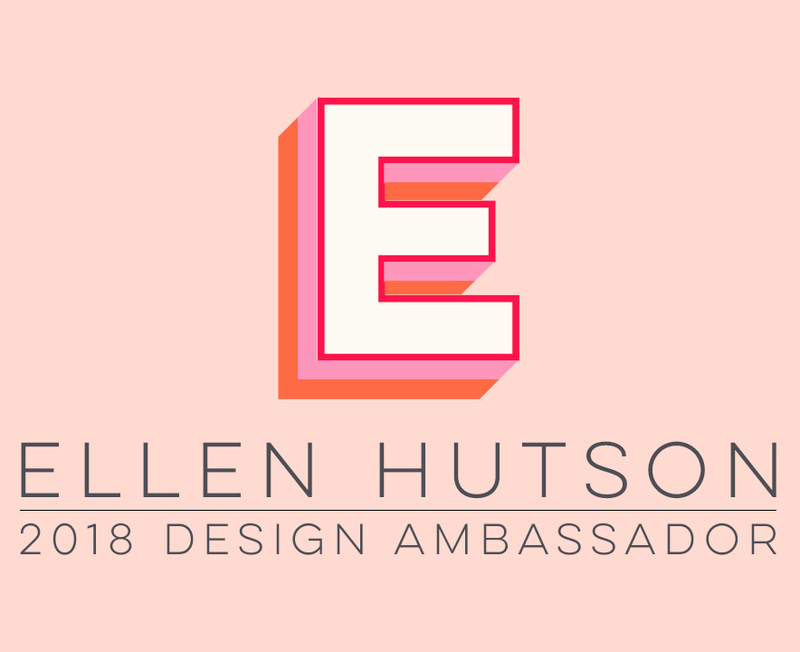 I'd love to see where you all are located! I'll be back later with that card! Stamps: Stampin' Up! Loving Hearts (sentiment) & Canvas background. 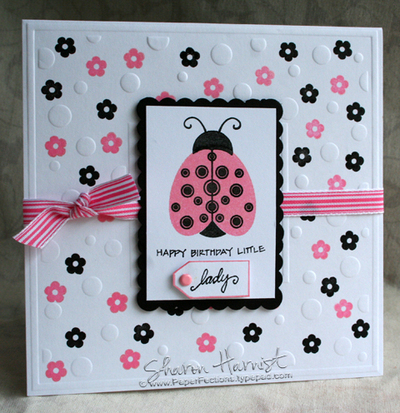 Paper: SU Pretty in Pink cardstock, Heidi Grace Love Blossoms paper. Ink: SU Classic Real Red & Regal Rose, Real Red Stampin' Write Marker, Rose Grosgrain Ribbon. Accessories: SU Chipboard Heart, Buffing Block, Anywhere Glue Stick. Heidi Swapp Flower Jewel & Ranger Liquid Pearls (flower centers). Prima Flowers, Stardust Gelly Roll pen (to color the flower in "you"). 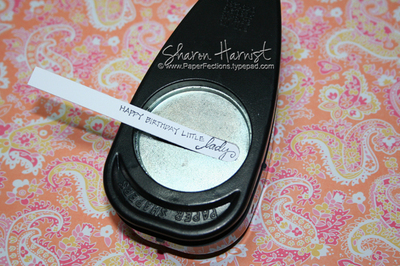 If I get something else stamped today (those are my intentions with Jami's challenge card!) I'll post it, if not -- look for the next set of faux stitching cards to start tomorrow! More exciting news I received in the mail yesterday -- my first actual paycheck for a published card! It will be in the upcoming PaperCrafts Stamp It! Cards 2007 issue due out just any time now!